Otter loves to play and brings as spirit animal with it the element of play. Many times Otter will make an appearance when we are taking life too seriously. We need to remember our inner child. 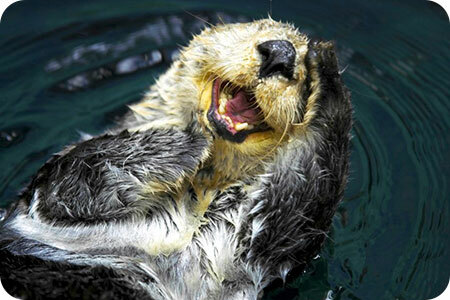 Otter brings joy and laughter. Often medicine is needed when we need to find our sense of humor. Otter also teaches us to cozy up to new things. We can’t welcome new things into our lives when we are clutching on to the past. Otter further brings spiritual awareness and devotion. It brings with it awareness of subconscious emotions and psychic abilities. Otter appearing in our lives is a wake-up call to be more aware of emotions in ourselves and others. Otters remind us not to be stuck in worry. Dwell instead on what is positive in life. This spirit guide encourages us to relax. Continuing under stress will steal joy from our lives. Otter encourages us to be generous with our self-love. It sounds cliché, but when we love ourselves we can love others. Otter teaches us that loving others comes from an abundance of self-love. People expecting children can welcome Otter as a great spirit guide. Otter is a very involved, attentive, and nurturing parent. Those born with the energy of Otter love to make people smile. Supporting others is a large part of Otter energy. Otter people are born with attributes of nurturing and love of children and family. I have been studying the The Wild Unknown Animal Spirit Deck and Otter also shows its adorable face in these wonderful oracle cards. Otter is just about the most joyful and happiest animal in this deck. This playful creature is all about absolute bliss. Otter is like a playful child. This child is available to us at any time. Sometimes through the course of life, the child in all of us gets pressed down so that we don’t often notice the inner child. Otter helps us to pull this child up to the surface so that we can enjoy life a bit more and maybe give comfort to the child within. Otter has a giddiness and reverence for being alive. When we are fully in the energy of Otter, there is no room for doubt and worry. What would it be like if we had more Otter energy? How different would life be if we could find the joy in all or most things? Sometimes there is no joy to be found and we must be a bit more loving and comforting to that part of us that is fearful, and the part that needs the Otter influence. Invoke the energy of Otter when you need knowledge quickly. Otter energy helps us have access to the collective unconscious. Otter energy serves to teach and guide us, if we choose to tap into that energy. What will you choose today? Mataya's Light Readings are a gift from a higher source that she's worked hard to develop throughout her life. She understands more than most what it's like to struggle with emotional and physical roadblocks and with a Masters in Counseling, she has spent many years using her natural psychic gifts and acquired knowledge to see clients through difficult patches. Since 1988, she's professionally guided others, using Tarot and other divination tools, at various psychic fairs in California. She's worked one-on-one with clients in metaphysical shops, and enjoys a successful online practice. She's channeled energies from her guides and passed on accurate information to her clients. A true Sensitive, Mataya takes on the energy of others, feeling and sensing their challenges. Her name came to her out of the blue one day and she has since learned that Mataya mean's God's gift. If you'd like to experience Mataya's incredible gifts for yourself, try a reading with this compassionate and accurate reader. You can find Mataya at PsychicAccess.com.